We’d love your help. 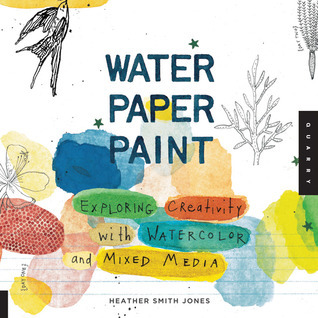 Let us know what’s wrong with this preview of Water Paper Paint by Heather Smith Jones. To ask other readers questions about Water Paper Paint, please sign up. This had some good information about color theory and I'm going to actually try several of the projects from this one! information. I chose this book to try and I glad that I did because it fits the bill perfectly for me! I love the feel and the smell of books - and have been known, on occasion, to not by a book it if the paper feels off. The paper binding this book s feels like watercolor paper. In the book Heather Smith Jones does cover the basics of watercolor paper - how to 'stretch' it (affix it to a surface so that it will not buckle when you paint) and what the surfaces of various papers are like. The books also has an excellent, short version, of how watercolor paints are created and how to branch out and make your own paints should you want to. There is an explanation of what all of those little numbers and letters on the paint tubes mean as well, what mediums to use and why. * how to work wet into wet and wet onto dry. You get the idea. Yes, it's basic but it also contains a wealth of usable information for folks like me who want the basics presented in an intelligible manner and suitable for a wide variety of mixed media work and textile art. I am very pleased with my purchase of this book - and think it would make a great addition to your artist's library as a mixed media or textile artist. I am sure that conditioned watercolor artists might be bored - but for me this was the perfect book. Just what I had hoped for ! I sat down and went through this book last night and read almost every word, which I usually don't do in a writing/art/journaling book in one sitting. This is an "outlet" book, and I desperately need an outlet right now! I can see using this with kids in their writing expression as well. Watercolor is such an easy medium for everyone because you really can't mess it up. It is inexpensive, and it makes a wonderful background for writing. Great book for people like me who enjoy the process of doing things but need a help with the creative spark that tells what to do or where to start. I found this a fun, light yet very useful take on an old subject. Heather Smith Jones demonstrates traditional and more experimental ways of using watercolors in a very approachable style. Her writing is complimented by a very nice layout for the book, with lovely photos illustrating the clear instructions. She starts with the basics: paper types, preparing paper, paints (including how to make your own watercolor paints). For the uninitiated, she explains many common techniques like painting sti I found this a fun, light yet very useful take on an old subject. Heather Smith Jones demonstrates traditional and more experimental ways of using watercolors in a very approachable style. Her writing is complimented by a very nice layout for the book, with lovely photos illustrating the clear instructions. She starts with the basics: paper types, preparing paper, paints (including how to make your own watercolor paints). For the uninitiated, she explains many common techniques like painting still life, experimenting with colors, using watercolor pencils and soluble crayons. She also shares tips on composition, creating textures and details through tools and methods like using salt, stencils and tape, squirting/blowing on paint. If you're not happy with your work (or even if you are), you might also consider cutting it up and reassembling it. If you're an experienced artist/crafter, you might not find the techniques new but it's a comprehensive list for beginners and many can be adapted for other media and mixed-media art. The paintings in the book are also a plus: Not only are they beautiful, they are also representative of a range of styles. A gallery of other artists' works also adds to the book's value. When I worked with preschool students (age 3), we incorporated variations of some of these explorations in our program, so I feel this is a book well worth checking out no matter what the age and stage of your kids. Good teaching tool for people looking to pick up watercolor/painting. Lots of pictures! Really enjoyed reading . . . now on to try all the wonderful things this book taught about watercolor painting. My first color book. This helped me understand medium and choose some supplies without being overly perscriptive. I am excited to try some of the projects. There's a nice array of projects and skills. The difficulty with the current crop of writers in the field of mixed media artistry is their inherent pretension. It's hard to count the number of "helpful" authors I've read who offer advice about materials, methodology and muse from the vantage of my-way-or-the-highway. I've been bullied, lectured and infantilized by, apparently, some of the most highly-regarded craftswomen working today. As I am not a fan of despots, particularly in the arena of hands-on art instruction, it gives me great pleasure here to draw attention to their counterpoint. Ms. Heather Smith Jones has produced a book that comfortably and efficiently guides her reader through the world of watercolor painting and its applications for mixed media expression. Her lush imagery and carefully-measured explanatory voice combine to present a genuine invitation to explore and create at will with materials she clearly respects and enjoys. You are her talented friend. She is your artistic support. Together painting will happen. In a genre shockingly sparse of capable teachers, this is one. Recommends it for: teachers, artists, teens, dabblers, The Generally Curious. Out of the shelf-fulls of books I've purchased over the years, this one is like having your own instructor right there. The writing is straightforward, the exercises are clear and speak to the reader in a nice way. No down-talking here. 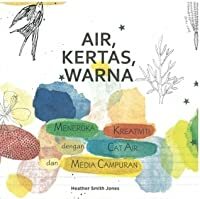 Lovely examples and photographs, and the author/artist gives her personal spin on the medium of watercolor and it's properties. I'd like to say I'm going to tackle each exercise over time and I just might! Definitely makes me want to get out my paper, paint and wa Out of the shelf-fulls of books I've purchased over the years, this one is like having your own instructor right there. The writing is straightforward, the exercises are clear and speak to the reader in a nice way. No down-talking here. I paint, but not watercolours. And I'm not schooled in it. So I found this book really useful educationally. I liked the variety of projects and instructions with pictures. While I doubt I will follow all of them, it did give me several ideas, and new methods to try. I can't ask for more than that out of an art book. The projects were really fun even if i once took watercolor classes the teacher didn't explain there are different kinds of paper (maybe because they only sell one here) and i'm glad i know know how to make my own watercolors! I'm sad i can't get all the materials needed in my city which made finishing all the projects a little hard, but i had a lot of fun! This book is relaxing, yet I've had so much FUN using it; it's like art-making as a kid again! And I had stupidly passed it by on the shelf many times before checking it out more and buying it. Just goes to show what I often say: the best stuff usually requires multiple interactions before it can be fully appreciated. Great starter book for watercolor painting with some non-traditional exercises and projects. If you've gotten jaded with watercolor paints some of the suggestions might inspire some lively fun in your thinking. The mixed-media section could be expanded. This is a good, basic book about watercolor. Lots of ideas for projects. I'm fairly new to this craft, but felt some of her ideas were pretty obvious. Nevertheless, they gave me good thoughts to put into my brain that I may use later. It was just o.k., like the stars said. Did not get too many ideas that I could use in my own art. Other people may get more than I did. I am more of a mixed media and art journal type of artist. This was a library book and I do not plan to buy this book. I have had so much fun doing some of the projects in this book and have learned so much. A few of the projects are a bit weird, but overall this is a great intro to watercolor painting. Would be good to use with children. About the first half of the book was review for me, because I have a fair amount of experience with watercolor. However, when she finally does get around to the mixed media part, I learned a lot of new things. There are so many ideas I want to try, maybe someday I'll make the time. Really nice book for beginners to watercolor. Plenty of diverse projects with something to appeal to everyone. Directions are non restrictive allowing for interpretation and creativity. Would be a great primer for someone new to the media. A helpful guide to basic watercolor techniques. I especially liked the Working Wet into Wet, Dabbing with Different Materials, Creating Negative Shapes with Tape and Stencils, Cutting and Reassembling a Large Painting. Love this book, really inspirational and keeps things simple. In addition to being instructive, this book is just plain pretty to look at. So many lovely things to try! Such a pleasing layout! Especially liked the color tile-style exercise and the awesome pattern for the "Making Marks with One or Many" exercise.